Excerpted from Saving the Place We Love. This outrage came right at the time when America was starting to pay attention. a time when our national consciousness was being raised on a whole host of dangerous corporate practices, not the least of which was dumping toxic chemicals directly into rivers. It was as though we were just waiting for a poster child, and there it was. The Cuyahoga stepped up to help usher in the environmental era. The incident spurred an avalanche of water pollution regulations—the Clean Water act (CWA), the Great Lakes Water Quality agreement, and the creation of the federal Environmental Protection agency (EPA). Every movement needs a spark, and this one ignited Americans to change. The Cuyahoga caught fire because flammable petroleum products were being directly and indirectly dumped into it. The CWA ended much of the direct dumping of pollutants into our streams and rivers, but it did not happen overnight. it took a great deal of enforcement, lawsuits and changes in industrial operations (best practice guidelines). It also required the introduction of processes and technologies to capture, manage, and safely discharge contaminants. All of that happened through a combination of behavioral and technical changes driven by regulations and regulators, and implemented by staff who had been inspired by professional societies and consultants. This is how we create change in America. The process is complex, but in the long run it is effective at changing our cultural and professional values and behaviors. Organic waste discharges into the nation’s waterways declined by 98 percent as a result of these actions. The large bubble represents all the water on earth. 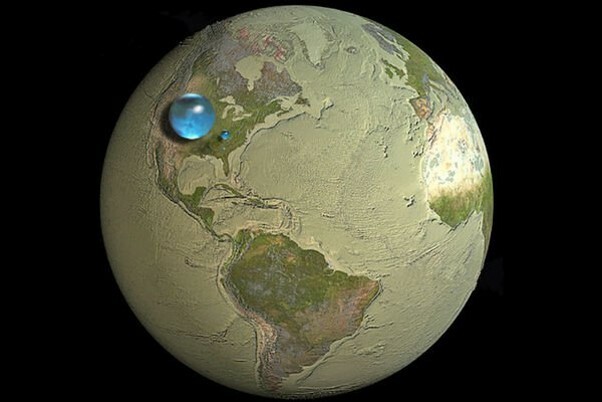 The small bubble represents the fresh water on earth. Spilling volatile petroleum and other chemicals into the river was clearly a big part of the problem with the Cuyahoga, but as it turned out, surface dumping is not the whole issue with our rivers. Some contamination comes along with groundwater that seeps out from riverbanks. Tens of thousands of new, man-made chemicals were created during the twentieth century, and some of them were found in natural seeps from our vast supply of underground fresh water! Yes, by the 1960s, we had been so negligent in the handling of a wide array of chemicals that we had contaminated our precious groundwater, our essential drinking water supply buried in aquifers all across the country! That was an even bigger problem, and at first we were not prepared to deal with it. Cuyahoga River Follow-up, 2013 — The Cuyahoga River became the poster child for a time when we did not focus on disposal practices, the health of our rivers, or even the health of our communities. Our culture has changed now to one where we do care about these things. The Cuyahoga has been cleaned up dramatically as a result of the enforcement of regulations born from its misery. Stretches of the river once devoid of fish now support up to forty-four different species. Today we can hold it up as a poster child not of carelessness but for a new period of awareness, a major success story of the last fifty years. Americans and our institutions have done an incredibly good job cleaning up our waterways. We have passed laws. We have stopped dumping the most toxic chemicals. People who did not follow the laws have gone to jail. Corporations have been fined, and most have changed their ways. it has taken a long time and quite a bit of effort, and it did not result in the economic catastrophe that many predicted when we required a change to our most egregious corporate practices. Workplaces are healthier today, the environment is healthier, and business bottom lines are healthier as a result. Our GDP continued to rise. It is a success story we should all be proud of, one that we can learn from, and one we can replicate. 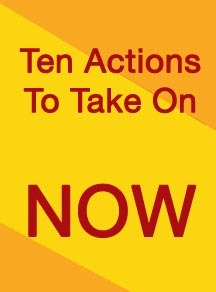 Aside from these successes, more clearly needs to be done. The challenge we face today in America is not the dumping of toxic materials by large manufacturing plants and refineries. Much of that is under control. The problem today is the residue generated by everyday living: the exhaust from our cars; the fertilizer we put on our lawns and farmlands; our widespread use of highly polluting fossil fuels; and the polluted rain water and sediment running off our backyards. All of this, yes, all of it gets transported downstream by our marvelous network of streams and rivers. On its way it damages not only communities and the base of our food chain but also many of the places we hold dear. Our streams, lakes, bays, beaches, and oceans are being damaged. According to the EPA, 55 percent of all rivers in the U.S. are still under duress. Over 30 percent of all rivers have high nitrogen and phosphorus concentrations. The health of the Cuyahoga, although better than it was in the 1960s, is not perfect today. The challenge it faces today is no longer that it will catch fire. Elevated awareness has clearly changed our culture. But the Cuyahoga River now faces the same problem that so many other rivers across the country do, the runoff of stormwater pollution from farms and yards. In much of the nation, fertilizer from agricultural operations makes up the largest part of the pollution. We have developed a series of best management practices for farms which, where they are used, do help. But the use of best management standards can be tricky. Farm conditions and practices vary. The Natural Resources Conservation Service is one of the best places to find more information on this topic (www.nrcs. usda.gov). No-till farming is a best practice that has reduced runoff of fertilizers and silt, but it requires the substantial use of pesticides. Furthermore, in farm fields where tile drains have been installed, the waters that flow out of these drains may have to be treated. Unfortunately, the latest U.S. Geological Survey (USGS) data for the Mississippi River basin shows the nutrient levels are still rising. They are also rising in most urban and suburban areas of the country. Those nutrients are coming from homeowner use of fertilizer and the nitrates that fall on our land from fossil fuel power plants. We are now dealing with the widespread challenges of managing the residue of everyday life in an overcrowded twenty-first century. This is excerpted from Saving the Place We Love. Take-a-way: In Saving the Places we Love, I have gone back to many of the environmental disasters of the past to see how they are faring today. These stories offer a fascinating perspective of what we have and have not accomplished over the past 50 years and what we all still need to do. By nedtillman in Calls to action, Rivers on May 12, 2016 .